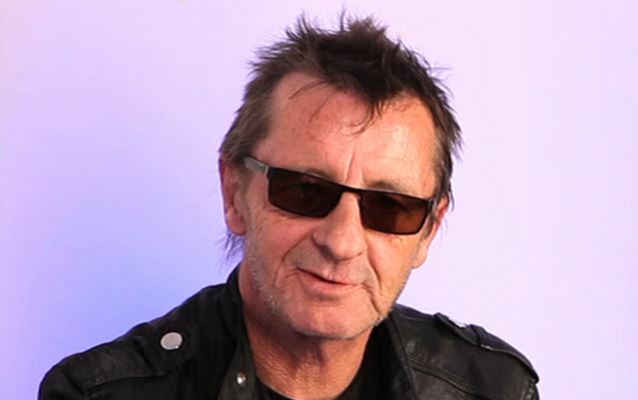 According to The New Zealand Herald, AC/DC drummer Phil Rudd entered a guilty plea to charges of methamphetamine and cannabis possession in a New Zealand court Tuesday morning (April 21). He also pled guilty to one charge of threatening to kill. A second threatening to kill charge was dropped. According to court documents, police found 0.478 grams (0.017 ounces) of methamphetamine and 91 grams (3.21 ounces) of marijuana during a November 6, 2014 raid on Rudd's home, which was conducted after he was accused of threatening to kill an associate and his daughter during a phone call in September. New Zealand prosecutors claim that on the morning on September 26, 2014, Rudd made two phone calls. During the first call he allegedly "spoke about what he wanted done" to an unnamed man who had been working for him for three years. The second call was allegedly to the unnamed man himself, and it was during this call that prosecution claims Rudd "threatened to kill him and his daughter." "This matter essentially revolved around an angry phone call — that was it," Rudd's lawyer Craig Tuck said outside court. "Nine police officers, a dog and media turned up at Phil Rudd's home, the home was turned over, and [police] subsequently charged him with attempting to procure a murder. "That was immediately dropped, and today we have seen another charge dropped." Rudd's originally scheduled February 10 appearance in a New Zealand courtroom to address charges of threatening to kill and drug possession was delayed until April 21 because Rudd's previous lawyer quit the case. Attorney Paul Mabey stepped away on what he described as "amicable" terms. He did not elaborate on his reasons for leaving, saying, "It's just a professional decision that we have made." Rudd's current lawyer, Craig Tuck, has "appeared in some of New Zealand's highest-profile cases acting for entertainers," according to LawAid.co.nz.